SUNROSE BEGA DIŞ TİCARET A.Ş. SUNROSE® is one of the largest processor and supplier of Sun Dried Tomatoes in the world with an unrivalled knowledge of the product. We pay the most attention on finest quality in order to ensure top product quality. SUNROSE® Tomatoes are dried under the sun to develop their full, rich flavour, characteristics of Sun Dried Tomatoes. Only the finest tomatoes are selected, processed with special care and packed carefully in high tech processing plants to serve an excellent product to our customers. The delicious Turkish sun dried tomatoes are produced at the coasts of Aegean Region mainly in Izmir and Manisa cities. Currently, Turkey is covering the 40% of the total world production solely. Our factory is located on 10.000 sqm closed area in Menemen / Izmir, has the capacity of 4.000 Mt/year. Our factory is the second largest and high tech factory in Europe for sun dried tomatoes processing. We are accredited by ISO 22000, BRC, IFS and Kosher certificates in our tomato plant. Our company became the leading supplier of Turkish sun dried tomatoes by exporting totally 3.500 mtons every year. SUNROSE® produces the raw material itself therefore can easily monitor the quality standards. There are 98 workers and 22 administrative employees are working in our factory. At the end of July, the weather is hot and settled enough for sun drying. This period lasts through August until mid September. The fresh tomatoes are harvested, inspected, washed, cut and lay out by hand on special plastic sheeting. The fresh tomatoes on receipt are inspected and hand sorted, the tomatoes which have defects are removed. The tomatoes then enter a wash tank of chlorinated water. On exiting this, the tomatoes are sprayed with potable water and then conveyed to the cutting machine, where they are sliced in half, dices or stripes. The halved tomatoes are conveyed through a brine bath containing sulphur dioxide as per the time defining the specification. After this, tomatoes are transported to an adjacent site to be placed open side up for drying. The site is situated to minimize air-borne contamination. The sun dried tomatoes are then bagged and transported to chillers where they are stored at less than 5°C to help preserve the color. The sun dried tomatoes are double washed and triple hand picked by the well experienced SUNROSE® staff under the latest modern food processing technology. After the process at the production lines, the products are metal detected and packed for the shipment.The usual packing of sun dried tomatoes is 2x5 kg vacuum packs. 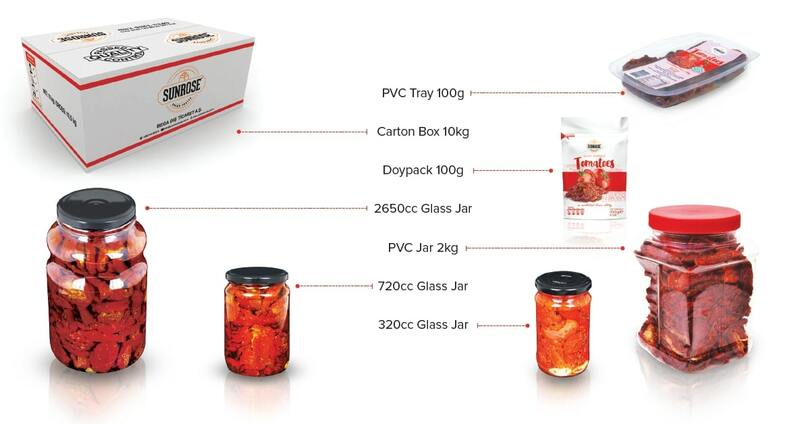 This packing can be changed such as 4x2,5 kg, 10x1 kg as per buyer’s requirement. SUNROSE® constructed it s own cool storage facility beside the factory area to control the quality perfectly and decrease the production costs as well. This highly controlled method of production ensures the finest quality sun dried tomatoes available. SUNROSE® is one of the largest processor and supplier of sun dried tomatoes in the world markets with an unrivalled knowledge of the product. Since the establishment in 1997, SUNROSE® has been one of the leading manufacturers and suppliers of Turkish Sultanas, apricots, figs, sun dried tomatoes and various kinds of dried vegetables.